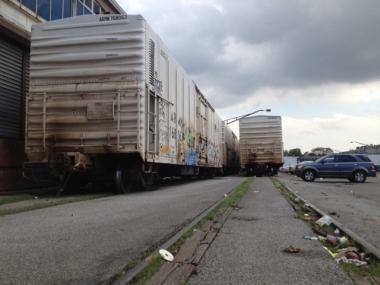 The $10 million grant will likely replace rail tracks such as these at the Hunts Point Terminal Market. SOUTH BRONX - The Hunt’s Point Terminal Produce Market will use a $10 million federal grant to beef up its aging freight rail distribution system, officials said Monday. The grant, which was approved last week by the U.S. Department of Transportation, will be a “win-win” for the state and city by helping keep the market in the Bronx while removing trucks from the roads, said Rep. Joe Crowley. He was joined Monday at the complex by Rep. Jose E. Serrano to discuss the plans for what is the second largest wholesale market in the world, supplying 60 percent of the city’s fresh produce and employing more than 3,500 workers, according to the city. Officials did not divulge details of the renovations, nor did they give a timeline for when the rail improvements would be completed. No renovations can take place until the market’s merchants and the city agree to a new lease. The current lease extends to 2014, but if a new deal is not reached before June 29, the merchants' cooperative is free to resume talks with New Jersey officials to relocate the market across the Hudson. The merchants currently pay the city $4.5 million in rent a year for the market, which generates approximately $2.3 billion in annual revenue. Matt D’Arrigo, president of the market, said the rail plan would likely include an entirely new system for loading and unloading rail cars within the market. He is confident a plan would be developed within six months to a year. Currently, 18 miles of train tracks crisscross the market, which processes between 2,500 and 3,000 train cars each year. The market’s railroad layout does not allow crews to unload trucks and trains simultaneously, D’Arrigo said. The process of unloading and filling rail cars takes eight hours and requires crews to move trucks to accommodate the trains. The merchants’ cooperative and the city have long discussed renovation requirements for the 45-year-old market. If the 115 firms that operate in the market decide to remain in The Bronx, the space will need major renovations. The two sides have set the renovation cost at $332.5 million, split equally according to the city’s Economic Development Corporation, which is a party to the negotiations.